George Orwell, a socialist who fought for the Soviet-backed government of Spain in the Spanish Civil War, wrote prophetically in 1936 that "Socialism, in the form in which it is now presented, appeals chiefly to unsatisfactory or even inhuman types," including, among others, "the astute young social-literary climbers who are Communists now, as they will be Fascists five years hence, because it is all the go." Five years later, Adolf Hitler and Joseph Stalin were partners in the Nazi-Soviet pact, the joint invasion of Poland and the division of Europe; Orwell watched in despair as his former comrades supported the pact, even as Hitler launched his Blitz on London. When Britain declared war on the Nazis, German Communist Party leader Walter Ulbricht denounced not Naziism but "English Imperialism" as “the most reactionary force in the world”: “The [Nazi] German government declared itself ready for friendly relations with the Soviet Union, whereas the English-French war bloc desires a war against the socialist Soviet Union,” declared Ulbricht. “The Soviet people and the working people of Germany have an interest in preventing the English war plan.” When France fell to the Nazi invaders, French Communist Party leaders Maurice Thorez and Jacques Duclos exulted that "the struggle of the French people has the same aim as the struggle of [Nazi] German imperialism." During the battle of Britain, "Communists in the factories actually fomented strikes, and spread defeatist propaganda in the blitzed areas of London," writes Orwell prize winning journalist Peter Hitchens. By the time the war was over, it had become impossible even to discuss the issue: "The word 'Fascism' has now no meaning except in so far as it signifies 'something not desirable'," wrote Orwell. "Since you don't know what Fascism is, how can you struggle against Fascism?" 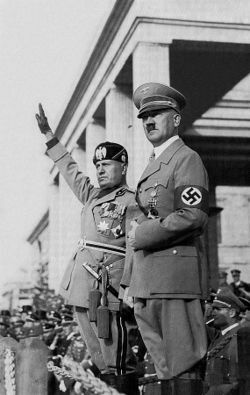 Particularly in the United States, the word "fascism" had become confused with the rights of private property and economic freedom, which had previously been called "liberalism"; meanwhile, the word "liberalism" had been redefined to denote the very "state-capitalist" mixed economy that characterized Fascist Italy and National Socialist Germany. "As a supreme, if unintended compliment," quipped Harvard economist Joseph Schumpeter, "the enemies of the system of private enterprise have thought it wise to appropriate its label." This debasing of meaning, making reasoned discourse and clear thinking impossible, was precisely what Orwell was illustrating in his novel Nineteen Eighty-Four by means of "Newspeak." Those policies that are today called "liberal"—big government, high taxation, regulation, state intervention in or control of the economy, public-private partnerships, state control over the use of private property, etc.—were all pioneered by the fascists, who called this economic system corporativismo (corporativism). Contrary to revisionist socialist propaganda, the name has nothing to do with incorporated firms, but refers to the medieval system of guilds (corporazioni), theoretically modernized as syndicalism. Corporativist ideas had been popular with British socialists and Fabians, as well as American progressives such as Herbert Croly, Edward Bellamy and Colonel House, since the late 19th century. Far from being capitalist, corporativism was stridently anti-capitalist. “So substantial are the limitations under which private property and capital are exercised in Italy, that the conception of ‘capitalism’ is avowedly destroyed and replaced by corporativismo,” wrote Herbert Steiner in his classic 1938 study of fascism. Under fascism, writes the progressive writer Roger Shaw, "capitalistic laissez-faire of the old, familiar type practically disappears under state-planning." "[T]he rise of fascism and Nazism was not a reaction against the socialist trends of the preceding period but a necessary outcome of those tendencies," wrote Nobel prize winning economist Friedrich Hayek. On a similar note, fascism and National Socialism were also falsely conflated as being right-wing movements instead of left-wing movements. "Originally, fascism saw itself as profoundly revolutionary—not conservative (as the left now sees it)," writes Christopher Harmon, professor of International Relations at the US Marine Corps University. Mussolini had been a Marxist, who took over the Italian Socialist Party at the Congress of Reggio Emilia in 1912, expelling the syndicalist heretics and espousing doctrinaire Marxism—prompting Lenin to write, “the party of the Italian socialist proletariat has taken the right path.” Five years later, Lenin took over Russia, the following year imposing socialism (“War Communism”); it quickly and spectacularly failed, producing mass famine and economic collapse. In response to this failure, Marxists and other communists scrambled for a "Third Way" between socialism and capitalism: an alternative to the market, but one that might actually work. Lenin thus introduced his New Economic Policy, based on Oskar Lange's theoretical "market socialism"; Mussolini, meanwhile, resurrected the ideas of the syndicalists he had previously ousted. "The most important influence upon Mussolini's development," writes his biographer Renzo De Felice, "was that exercised by revolutionary syndicalism." Most, but not all, of the leading organizers of Italian syndicalism became active fascists. Syndicalism (syndicalisme) was the French name for the British idea of "guild socialism." Being Italian nationalists, Mussolini and his followers gave it an Italian name, corporativismo (corporativism or corporatism), from corporazione (guild). The fascists ordered all labor unions and industries into cartels, (corporazioni)—administrative units of the government, through which it set production levels, wages and prices. It is often claimed that corporatism means "the power of business corporations over society." For example, in the wake of his upset defeat by Tea Party backed challenger Dr. Nan Hayworth, then-Congressman John Hall (D-NY) said, "I learned when I was in social studies class in school that corporate ownership or corporate control of government is called Fascism." Likewise, an article published by the Council for Secular Humanism claims that under fascism, "the ability of large corporations to operate in relative freedom was not compromised." While he didn't mention business, President Franklin Roosevelt, a liberal Democrat, said, "in its essence... fascism [is] ownership of government by an individual, by a group, or by any other controlling private power" (a statement approvingly quoted by secret Communist George Seldes). Such claims are often buttressed by an apocryphal quote, attributed to Mussolini, that "Fascism should more properly be called corporatism because it is the merger of state and corporate power." But there is no evidence that Mussolini ever said this, and as one self-proclaimed "progressive activist" admits, "it contradicts most of the other writing he did on the subject of corporatism and corporations." Corporatism has nothing to do with incorporated firms or businesses; all fascist movements have in common the aim of "eliminating the autonomy (or, in some proposals, the existence) of large-scale capitalism and major industry." That is because property rights are a bulwark against the state: by outperforming the state in the satisfaction of social needs, the market offers an alternative to the state's aggression-enforced monopoly on legitimacy. As Mussolini put it, "Our formula is this: everything in the State, nothing outside the State, nothing against the State." While it may preserve the appearance of ownership, corporatism strips owners of control of their property, thus stripping "ownership" of meaning. Under fascism, "the state directs and controls" business, exercising "absolute authoritarian control of production." As Mussolini put it, "the organiser of the enterprise is responsible to the State for the direction given to production." He demanded "State intervention in economic production" whenever "private initiative is lacking or insufficient, or when the political interests of the State are involved. This intervention may take the form of control, assistance or direct management." Under fascism, the "private employer is retained, but he is stringently regulated by the state," writes progressive writer Roger Shaw. "Communism eliminates the private employer and profit-maker, but Fascism, at least in economic theory, retains him as a slave of the state." The state thus becomes the de facto owner, reducing de jure owners to bureaucrats, carrying out government orders. It is therefore more accurate to say that "corporatism" means government control of corporations than corporate control of government. National Socialism, emerging from the shattered remains of the Austro-Hungarian Empire in the wake of World War I, promised yet another a "third way" between capitalism and communism. Whereas Communism sought to unite the working class of all nations to fight for their class, and fascism sought to unite all the classes within a country to fight for the State, National Socialism sought to unite all members of a race, from whatever class or nation, to fight for their race. It was this "Third Way" that attracted Adolf Hitler. As early as 1933, Nobel Prize-winning economist F.A. Hayek warned William Beveridge, director of the London School of Economics, that "National 'Socialism' is a genuine socialist movement." "In no way was Hitler the tool of big business," admitted American Socialist Party leader Norman Thomas. Under Nazism, declared Hitler, "the attitude of the State towards capital would be comparatively simple and clear. Its only object would be to make sure that capital remained subservient to the State." David Schoenbaum notes that the Nazi Party census found the single largest category of Party members was “Workers” (30.3%); the second-largest category was “White collar,” (19.4%), of which 59.1% were in sales; the third-largest category, “Independent”/“Self-Employed” made up 19%, the largest group of whom were in “handicraft” (43.7%). Schoenbaum adds that of the two exhibits most often trotted out in defense of the Naziism-as-capitalist-plot thesis—Fritz Thyssen and the Krupps—that Thyssen eventually had to flee Nazi Germany for Switzerland, while even the Krupps “did not finance Hitler before 1933,” when his victory had become a fait accompli. Moreover, some business people likewise supported FDR's policies (e.g., "Although I'm a capitalist, I happen to believe in [Roosevelt's] program"). Even Ronald Reagan was a New Dealer, back when he was a liberal Democrat and a Roosevelt man (although he later saw the light, saying, "Fascism was really the basis of the New Deal"). Likewise, Nazi "domestic policies were remarkably friendly toward the German lower classes, soaking the wealthy and redistributing the burdens of wartime to the benefit of the underprivileged," including "transferring the tax burden to corporations." Along with its well-known anti-Semitic and expansionist planks, the Nazi Party program included a number of less-remembered demands that were (and are still) considered “progressive.” For example: “the State shall above all undertake to ensure that every citizen shall have the possibility of living decently and earning a livelihood”, “a generous increase in old-age pensions”, “specially talented children of poor parents, whatever their station or occupation, be educated at the expense of the State”, “help raise the standard of national health” by “providing maternity welfare centers, banning child labor, increasing physical fitness through the introduction of compulsory games and gymnastics, and by the greatest possible encouragement of associations concerned with the physical education of the young,” etc. As against individualism and the free market, the Nazis demanded “creation of a strong central authority in the State”, “COMMON GOOD BEFORE INDIVIDUAL GOOD” [Capitalization in original], that “No individual shall do any work that offends against the interest of the community to the benefit of all”, that “ruthless war be waged against those who work to the injury of the common welfare”, etc. By confiscating and redistributing the property of Jews, the Nazis sought what they called “a truly socialist division of personal assets.” To this end, the Nazis enacted price controls, rent controls, exorbitant corporate taxes, farm subsidies and harsh taxes on capital gains, which Hitler denounced as “effortless income.” It was in this atmosphere that the New Deal took shape. Even the Kremlin itself would on at least one occasion admit that Nazi Germany was a socialist nation. On October 7, 1939, the 22nd anniversary of the Bolshevik coup, the Comintern issued a statement describing the joint Nazi-Soviet invasion of Poland as "an example of cooperation of socialist nations against Anglo-French imperialism." ↑ Haynes, John Earl; Harvey Klehr, Alexander Vassiliev (2009). Spies: the rise and fall of the KGB in America. New Haven: Yale University Press. ISBN 0300123906. Retrieved on 9 January 2011. ↑ Artur Moeller van den Bruck's book The Third Reich (1923) was originally entitled The Third Way. (George Lachmann Mosse, Masses and Man: Nationalist and Fascist Perceptions of Reality [Wayne State University Press, 1987] ISBN 0814318959, pp. 84, 166) On Fascism as “third way,” see Zeev Sternhell, Neither Right nor Left: Fascist Ideology in France (Princeton University Press, 1996) ISBN 0691006296, p. 94, and Roger Eatwell, Fascism: A History, (London: Allen Lane, 1996), ISBN 071399147X, p. 11. ↑ Robert A. Nisbet, The Twilight of Authority (Oxford University Press, 1975), p. 183. Wilson's racism "was often of a piece with the reigning progressive obsession with eugenics, the pseudoscience that strove to perfect society through better breeding." ↑ Louis Leo Snyder, Documents of German History (Rutgers University Press, 1958), p. 393 et seq. This page was last modified on 9 April 2019, at 07:05. This page has been accessed 4,743 times.